Six of us just returned from a wonderful two week vacation on St Kitts and Nevis. Two of us are regular visitors and we always find new and interesting things to do. This trip was different because we got to experience some real tropical downpours which usually started in the late afternoon and lasted several hours instead of the usual 15 or 20 minutes! On several occasions, we were awaked at night by winds and rain. This did not dampen our spirits as it is the rainy season and just to see nature this way was exciting. All the ghuts were running and the surrounding mountains and hillsides were as green and lush as one could ever see them. The "wild" goats and cattle on the peninsula looked very healthy due to an abundance of grass and new growth on the bushes. Many times we have noticed how boney they have looked. I think that all who live there would agree, though, that the land is saturated to the point of potential landslides and enough is enough. 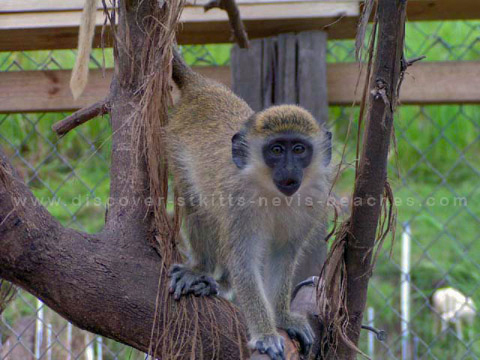 We are fortunate enough to have made quite a number of friends on both St Kitts and Nevis. Each time we visit, it is fun to renew their acquaintence and hear all the recent news. This is a major reason that we continue to visit and find interesting things to do in addition to the regular touristy things. Being "touristy" is fun too. 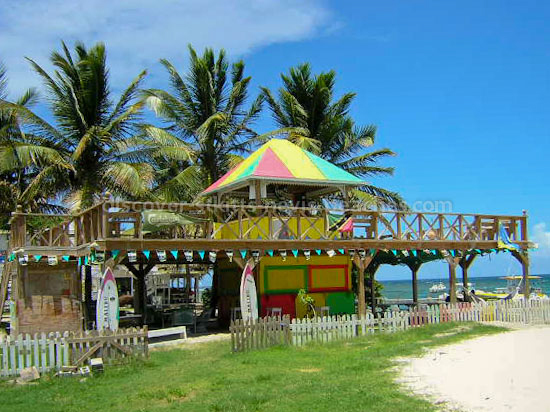 We had nice meals at Spratnet, PJ's, Turtle Beach for the Friday night buffet,Shiggety Shack, Stonewalls, and a breakfast or two at the Marriotts' Calypso Cafe. This trip we did not go to Marshalls or the plantations for any meals. We did, however, stop to tour the grounds at the big 3. 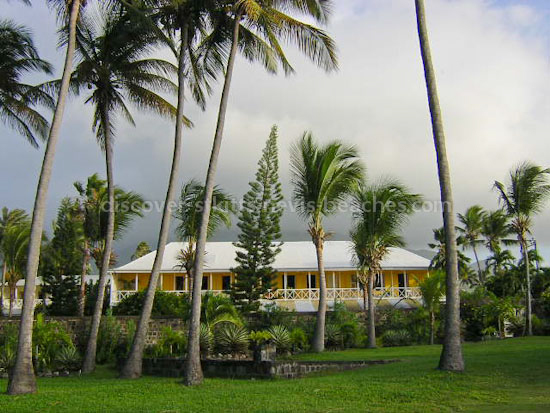 The Golden Lemon with its' beautiful palm grove on the black sand beach, Ottley's and the ghut rain forest trail, and Rawlins' - Kate Design studio. Kates' husband Phillip, who is always very outgoing, is responsible for the planting and upkeep of many new Flamboyant trees along the roadside in the miles in either direction of the Rawlins' turn. The Flamboyant is the National tree of St Kitts, flowers during the Summer with huge red flowers, and produces a wonderful, big, long seed pod which when dry, then shaken, produces a "shack, shack" sound. The pods now are still hanging on the trees and are green. The young trees that Phillip and Kate have planted are surrounded by wooden "cages" made from pallets and painted a Caribbean blue. These cages keep the goats from eating them. In years to come, they will create a tunnel of sorts to drive through. Phillip has also been building a 12m sailboat in the yard of the studio and each time we visit, more and more progress has been made. We asked about its' name, but only got a wry smile and was told that the name was a secret only known to himself. All of us guys, having had long term female relationships, strongly suggested the name "Kate"! The Northern half of the island is my favorite due to the rural feel and views of the Atlantic across the fields of sugarcane. So much different than the "urban" Southern section. We did visit the distillery where all the rums of the island are born. CSR, ST Kitts Rum, Belmont Estate, and Brinleys. This is in Bird Rock across from the bakery. Alfred, a man in charge, spoke of the history of rum making in St Kitts, especially CSR which sadly, will disappear soon and never be made again. It is a long story and one that deserves to be heard. There is only a little of the distilled alcohol left to create CSR, and when that is gone, there will be no more. I bought alot to bring home! The St Kitts Rum cannot be found anywhere on the island. Only the Coconut version in light or dark.